How to Start a Bulk Candy Gumball Vending Machine Business! Gumball Candy Vending Ebook! How to Start a Bulk Candy Gumball Vending Machine Business! Candy Vending Ebook! Are you ready to start your Bulk Gumball and Candy Vending Business? delivered into your email instantly! 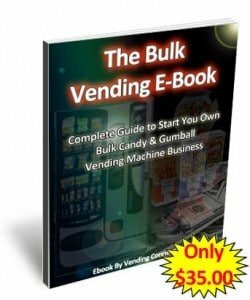 Vending Connection has years of experience and expertise packed in this Bulk Candy Vending Machine E-book and offered to save you time and money to get your business profiting as soon as possible. Don’t accept others claims, this is right from the authority in vending! The Pros and Cons of Bulk Vending, Candy Product and Gumball Vending, Bulk Product Types, New Interactive Gumball Vending, Charity Sponsorship, Paying Commissions to vending locations, Expenses, Buying Products, Products that you can Vend, Special Tips, Record Keeping, Your Vending Budget, Route Service Cards, Location Evaluation, Location Call Script, Locating Companies, Charities, Types of Locations,Start your own Bulk Vending Business today – the Bulk Vending Ebook for only $35! Sample Vending Service Contract, Route Management Software, Financing or Leasing, Insurance, Licensing, permits and more. Bulk Vending Suppliers Contact Listings, Quiz for Small Business Success, Vending Terms Dictionary. This is the Ebook for you!! READ THIS FIRST – If your are wanting to start your own SUCCESSFUL bulk candy & gumball vending machine route in 2018! Don’t forget to list your new vending company on the Vending Yellow Pages – Operators Directory! Looking for More Vending E-Books? Looking for Bulk Candy Product Suppliers? see The Vending Yellow Pages Suppliers Directory!